It's the most trusted institution in America. Its most prominent practitioner is the most trusted man in America. By an overwhelming margin, Americans give it high marks for fairness. What is this paragon of virtue that our citizens hold in such high esteem? Now before you hurl these pages to the floor and demand to know what planet these assertions come from, there's one footnote to keep in mind: This is how Americans regarded TV news half a century ago. Today? A recent Gallup Poll found that TV news ranked among the least admired of institutions: only 10 percent of us had a "great deal of trust in the medium; only 11 percent had "quite a lot." Only big business and the U.S. Congress had lower numbers. Another survey by the digital website Take Part found only 29 percent of Americans thought news organizations generally get the facts right; more than half thought news "often inaccurate." And our most prominent news anchor? He's bounced from his chair for telling tall tales about the stories he covered. What has happened over the last 50 years? Why do so many Americans no longer trust this once-venerated source of information? 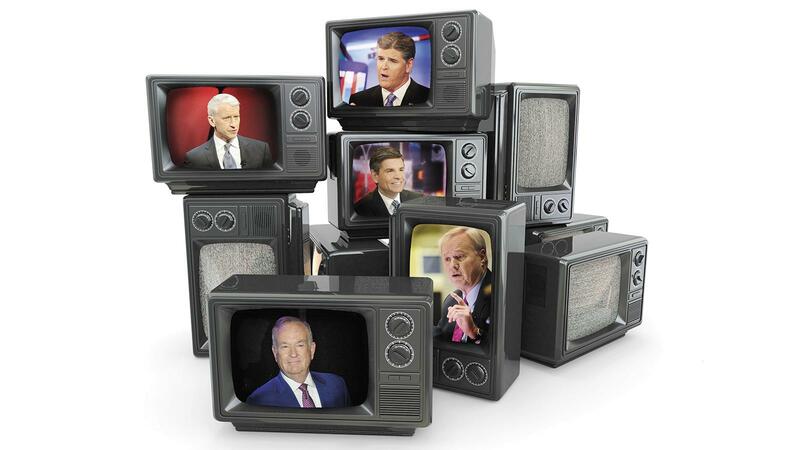 For a lot of people, the answer is simple: television news abandoned its stance (or pretense) of objectivity and became a voice of advocacy for a liberal agenda. That view helped fuel the rise of Fox News—with its claim to be "fair and balanced"—to its dominant position among the three cable news networks. It's reflected in the Gallup Poll findings that 44 percent of Americans think the media are "too liberal." But that's far from the whole story. On a given night—at least, when Donald Trump is not in a debate—the network pulls in some three million viewers; this in a country with more than 110 million TV households. Moreover, a near-record high percentage of us—19 percent—now regard the media as "too conservative." In this sense, the discontent spills over traditional Left/Right lines. The more complete answer is that this loss of faith does not come from one single source. It lies in part in the changing nature of what we think of as "news;" in part from a broader loss of faith in our institutions across the board; and in part from serious self-inflicted wounds. More disturbingly, the source of the discontent matters less than the consequences: widespread distrust in news leads to a public with no common source of information on which they rely. That, as we'll see, bodes ill for the health of our politics. When network television news arrived in 1948, it was a modest enterprise: 15 minutes long, with technology stuck in movie newsreel days. But by the early 1960s, it was a half-hour offering, with bureaus around the world, and—crucially—with a near-monopoly of the TV viewing audiences. In those pre-cable days, only a handful of stations could find room on the crowded airwaves; that meant in most of America, viewers chose from NBC, CBS and ABC. With mass audiences at their disposal, the networks did not want to offend viewers of one political stripe or another, so the broadcasts were vigorously nonpartisan. This was a sharp contrast to newspapers, which endorsed candidates and sometimes turned their news pages over to their favored causes and candidates. All through the 1930s, '40s and '50s, the overwhelming tilt of the print press was toward Republicans. Harry Truman, Adlai Stevenson and other Democrats railed against the "one-party press." The Chicago Tribune, and Los Angeles Times at times functioned as near-agents of the Republican Party. By contrast, network TV news never endorsed candidates; for years, the only "commentary" was offered by CBS's Eric Sevareid, and it was so balanced, it was barely commentary at all. Ironically, one of the few exceptions to the "no opinions" policy of network news was the man venerated as the embodiment of TV journalism. Edward R. Murrow's "See It Now," a weekly, prime-time, half-hour broadcast, often made no secret about how it viewed the controversies it covered, whether it featured an Air Force Reserve officer unfairly stripped of his security clearance, the refusal of Indianapolis to rent its War Memorial Hall to the American Civil Liberties Union, or—most famously—the accusations of Senator Joseph McCarthy that Communists and their sympathizers lurked everywhere in the corridors of power. "We proclaim ourselves, as indeed we are, the defenders of freedom, wherever it continues to exist in the world," Murrow concluded, "but we cannot defend freedom abroad by deserting it at home." (In 1960, in his last broadcast for CBS, Murrow presented "Harvest of Shame," a searing indictment of the conditions of migrant farmworkers that left no doubt about his views.) Murrow, however, was not CBS's news anchor; and his half-hour stood in sharp contrast to the offerings of network news. It was years later, in 1968, that Walter Cronkite came back from Vietnam and argued that the only sensible path for the United States was to seek a negotiated settlement. It may well be myth that President Johnson said, "If I've lost Cronkite, I've lost middle America," but it is undeniable that the sight of a resolutely neutral anchor offering his opinion was a powerful message, because it was so unusual. So what happened? In part—as the Cronkite broadcast illustrates—the news itself became more "polarizing" as images of civil rights demonstrators being beaten and raging battles from Vietnam began to fill our screens. Unsurprisingly, some viewers blamed the messengers for what they were seeing. (Some Southern stations actually "went to black" during network newscasts when they ran stories of civil rights protests.) Reporting of the Vietnam quagmire became a source of political arguments, especially when Vice President Spiro Agnew assailed the TV networks, not just for critical coverage of Vietnam, but for its mindset, saying: "The American people would rightly not tolerate this kind of concentration of power in government. Is it not fair and relevant to question its concentration in the hands of a tiny and closed fraternity of privileged men, elected by no one, and enjoying a monopoly sanctioned and licensed by government?" The Watergate scandal may have been a powerful rebuttal to the Nixon Administration's charges of bias and it clearly revived the image of the press as an agent of "speaking truth to power," but Agnew's indictment had staying power. The old movie image of a gruff, no-nonsense regular guy ripping the lid off the corrupt power brokers was accompanied, if not supplanted, by the image of highly paid, big-city sophisticates who neither understood nor sympathized much with the rank-and-file American, living in that stretch between New York and Los Angeles some network executives called "flyover country." The TV network anchors and correspondents, in other words, were more "them" than "us." What affected the TV news universe fundamentally was less a matter of attitude than broader societal shifts and a revolutionary structural change in the media. After the hammer blows of a war gone sour, a cultural revolution that divided generations and the most serious political scandal in American history, trust began to erode not just in the news media, but in all institutions. In 1964, three-quarters of us trusted our government to do what is right "all or most of the time." In the last Pew survey, that number was down to 24 percent. Moreover, no institution in American life has escaped a serious erosion of trust: not business, not labor, not the banks, not religion, not our schools. It would have been impossible for the source of disquieting information about these institutions to escape that same sense of disillusion. And one of the factors behind that loss of trust was that television news took the critical eye it had aimed at racial injustice and the war in Vietnam and turned it on a wide range of institutions, nowhere more successfully than with the birth in 1968 of CBS's "60 Minutes." As envisioned by its creator, Don Hewitt, the correspondents were far more than passive gatherers of facts. Dan and Mike and Morley and Leslie and Steve and Ed were knights-errant, roaming the countryside in search of the bad guys. Crooked car repair shops, Medicaid-robbing doctors, fraudulent mortgage brokers, purveyors of dangerous goods, public officials on the take, all found themselves in the crosshairs and often trapped in an ambush interview, convicted by evidence of their misdeeds by hidden cameras. Here there was no pretense of "neutrality;" here was a team of journalists acting almost as prosecutors. The enormous success of "60 Minutes"—by far the most profitable news program in history—spawned a legion of imitators, both at the network level and at local stations across the country, hundreds of which deployed "investigative reporters" to find homegrown villains. Some of the reporting was exemplary; some of it superficial. But the "60 Minutes" approach to news clearly marked a sharp departure from purely "fact-centric" stories. Even as the broadcast networks were expanding their definition of news, a structural revolution was about to begin that would enable an army of voices—sometimes, angry, discordant voices—to find a place on the screen. That revolution came from the sky—22,000 miles above the earth, to be specific, where communications satellites, launched in the mid-1960s, shattered the network monopoly of long-distance images. Key to this change is how traditional network news responded. Since it could no longer automatically command big audiences, it could no longer assume that viewers would be content with traditional news—not with dozens of choices at the flick of a remote. And for one of the best of television's journalists, this had enormous—and unhappy—consequences. Ted Koppel was with ABC for close to half a century. For half of that time, he anchored "Nightline," a program I was part of for 13 years and which—pardon my bias—stands as one of the crown jewels of TV news. Koppel, therefore, can remember what network news was—and what it has become. "Back in the days of the three networks," he says, "there really was a sense of mission. ‘We need to give the public what we think it needs to know.' One of my bosses back then said, our job is to tell people what is the most important thing going on in the world, in the country, in our lives today? If we answer those three questions, we're doing our job." And now? Koppel recalls a conversation he had with a significant network personality.
" ‘For the past two weeks,' I said to him, ‘your lead story has been it's hot. What are you doing?' He said, ‘We've been told by researchers that what the public wants more than anything else is the weather.' These shows barely deal with the news anymore. The sad reality is, they're not saying anything; they're not telling us what's important anymore." Much of the public, I think, is onto this. It helps explain why so much of Jon Stewart's "The Daily Show" lampooned the cluelessness of their "correspondents." Far from being heroic seekers of truth, they were preening peacocks wallowing in their own ignorance. The fact that Stewart's audiences embraced those portrayals speaks volumes about their respect or lack of it—for what passes as news. And it did not exactly help the craft that, 50 years after Walter Cronkite's "most trusted man in America" standing, NBC's Brian Williams was forced to leave the anchor post because he had exaggerated or invented tales of his reporting in an effort to be more like his globe-trotting predecessors. Finally, the explosion of alternatives to the three-network monopoly has meant a flowering—if that's the right word—of heavily opinion-based information. Starting with the unlamented "Crossfire" on CNN, multiplying with the Right-oriented Fox News and the Left-oriented MSNBC, viewers can now get their news from sources guaranteed to reinforce, rather than challenge, their preexisting beliefs or prejudices. When the networks showed black marchers being set upon by police dogs and club-wielding cops, it had powerful impact because, in part, it came from a trusted news source. When TV news showed images that shocked or unsettled or provoked—crime victims in our big cities, civilians driven from their huts by American troops—it often meant that the viewer might rethink his or her beliefs about civil rights or crime or war. Now, it's more and more possible to spend hours in front of a TV set absorbing data that rarely if ever challenges assumptions; and if a viewer happens to click on a news network not to his liking he can dismiss whatever he hears as coming from a tainted source. Actually, it's more than possibility, it's a practice embraced at high levels of decision making. Some years ago, I ran into a liberal U.S. Senator who made a daily ritual of watching Keith Olbermann, then the Bush-bashing star of MSNBC. Why, I asked, after a long day doing political battle, would you want to spend another hour listening to the same familiar arguments? The answer was telling: "Because it's like sinking into a nice, warm bath." I'm sure that in other venues, decisionmakers of a conservative disposition were sinking into a different nice, warm bath...perhaps Bill O'Reilly. Nice, warm baths are comforting, of course, but they are different from the bracing stimulation of reporting that shows you what you may not want to see, that challenges you to rethink long-held beliefs. To be effective, however, the consumers of that reporting have to trust that they are being informed in good faith, by a reporter who, as Sgt. Joe Friday used to say on "Dragnet," was offering "just the facts, ma'am." And what if that confidence, that trust is absent? Here's how one nonpartisan website, The General Good, measures the consequences of this erosion of confidence in our mass media. "Overall, media distrust leads to substantial information loss among the mass public. Those who distrust the media both resist the information they receive from institutional news outlets and increasingly seek out partisan news sources that confirm their preexisting views. As a result, these individuals are less responsive to national policy outcomes, relying more on their political predispositions to form beliefs and preferences." "It's the most dangerous thing that can happen to a democracy. If all people are doing are listening to their own opinions they'll never realize there's another point of view." And for millions of Americans, there are countless outlets that provide an unbroken stream of precisely that kind of reinforcement. On talk radio, dominated by the Right, stations in one city after another offer total uniformity, moving from Rush to Sean to Laura to Mark with no competing voice. A listener devoted to such a station, with its assertions about Barack Obama's anti-Americanism or Hillary Clinton's criminality, would find a broadcast network evening news hopelessly wrongheaded. Similarly, a devotee of political websites, where the Left is strong, would come away from a few hours in front of the computer screen contemptuous of the failure of TV news to chronicle daily the Republican Party's permanent War on Women. In this media universe, the wisdom of the late Senator Daniel Patrick Moynihan—"Everyone is entitled to his own opinion, but not his own facts"—seems almost quaint. In fact, more and more of us do feel we're entitled to facts from our side of the political divide. Behavioral psychologists have shown us in a series of experiments that people who listen only to those who share their views tend to move toward the more extreme corners of those views. And when confronted with evidence that contradicts their beliefs, more and more people simply dismiss the evidence as tainted or biased. I hold no brief for "the good old days" when a trio of networks monopolized the business of television news. I think abundance has many virtues, including the broadening of the spectrum, the presence of free wheeling, sometimes edgy debate. I admire new players who have widened the possibilities of delivering information, such as "Last Week Tonight With John Oliver" on HBO with Oliver's lengthy (and profanely funny) examination of complex issues such as tax policy and credit scams. What I miss, however—and more important, what our society misses—is the reporting that earns the trust of Left, Right and Center, so that our political debate can begin with an agreement on a common set of facts. There is a lot less of that now. And that loss is costing us dearly. Jeff Greenfield is a five-time emmy winning network news analyst and author.